To be successful, leaders in every type of organization must find practical and action-oriented ways to market their ideas and achieve buy-in from the members of the group. 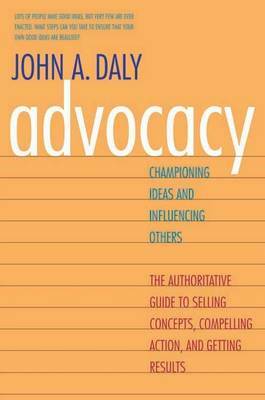 Daly offers a comprehensive action guide that explains how to shape opinion, inspire action, and achieve results. Drawing on current research in the fields of persuasion, power relations, and behavior change, he discusses the complex factors involved in selling an idea-the context of the communication, the type of message being promoted, the nature and interests of the audience, the emotional tenor of the issues at stake, and much more. For the businessperson, politician, or any other member of a group who seeks the satisfaction of having his or her own idea take shape and become reality, this book is an essential guide.